Krown VibeAlert Alarm Clock is an ideal product for anyone who suffers with hearing impairments or for those who have a hard time waking up in the morning. Featuring a strong 60Hz bed shaker and high volume buzzer, users can sleep peacefully knowing they will be woken up on time each morning. 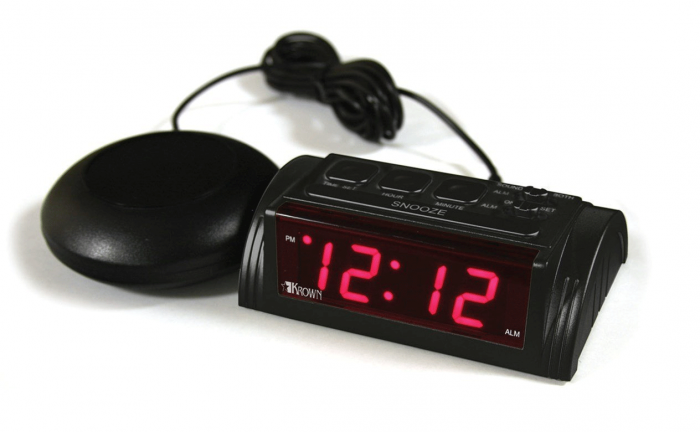 Featuring a large, easy to read 0.8" LED display and easy set alarms with snooze option, this remarkably compact clock packs a punch. Specifically designed to wake up even the deepest sleepers, the Krown VibeAlert Alarm Clock is durable, travel friendly and effective. A large snooze button rests on top of the device and the bed shaker plugs into the back of the clock for placement underneath your mattress.